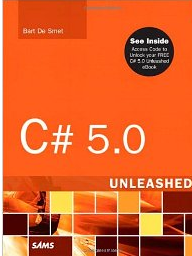 I had the pleasure to made a technical review of the book C# 5.0 unleashed some months ago, now that the book is already publish and for sale i can share my opinion with you all about this book, that promises to be a language reference book. When asked to make a review of this book, i had accept the challenge and i must confess I was not sure i will read a book with so quality like this. Is no easy to explain a programming language that is in it’s 5 generation, and keep the reader full immersed until the end of the book especially in a so technical book like this and especially when the reader is me who had learn C# at so long time ago and have already using C# 5.0 at about a year. I would recommend this book for all the developer’s that are now starting to learn C# and for the ones who hadn’t been working with the language for some time. For the other’s i think this is a good reference book to quickly understand deep the new features of the language. If i have to train new professionals in C# today definitely this would be the book i would chose as my recommended C# 5.0 book. I Would like to thanks to Bart to Pearson Company and to SAMS the opportunity to read in first hand this book and was a pleasure to help with the review. I sincerely hope to see more good technical books like this in the market.